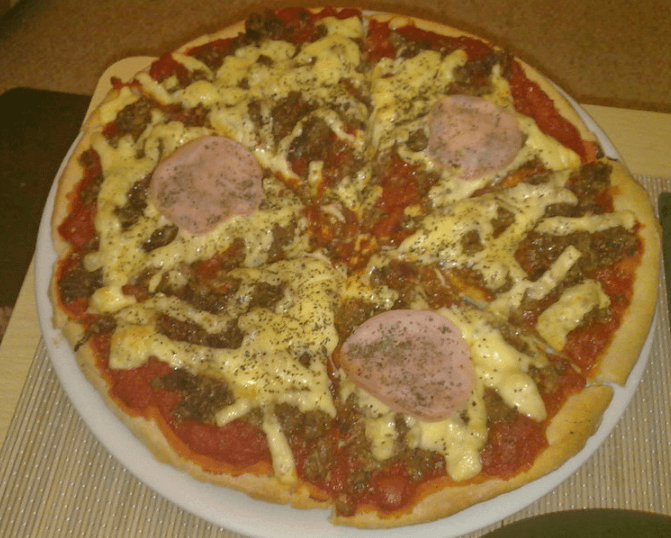 A no yeast pizza recipe – usually I keep yeast in my baking cupboard, but occasionally I forget to stock up! This was one of those occasions, so I improvised with self raising flour. It tasted really good and I don’t think it came out too badly for a first try. To make the crust: Combine the salt, flour, oil, and water, mix well. Lightly flour your work surface and roll out the dough. If you like a thick crust, you can roll the edges of the dough over or leave flat for a thin crust. For a stuffed crust, add cheese as you roll the edges. Cover the pizza with sauce, cheese and your choice of toppings. Bake for 10 to 15 minutes, until the cheese is melted and beginning to brown, and the edges and bottom of the crust are golden brown. Take the pizza out of the oven and allow to cool. Sprinkle lightly with Pizza Seasoning or dried Italian herbs to serve – optional. No time to make your own base? No problem. Many supermarkets offer plain bases (or ones with a small amount of cheese and sauce on them) which can be easily customised with your own toppings. Pizza comes in all different shapes and sizes. Not everyone puts sauce on their pizza so does that not make it a pizza, I think not.